The Inventor of the 2X2 motorcycle was an eccentric man named Charlie Fehn. Charlie, born in 1915, was a self-taught inventor by trade and was always working on many projects at any given time. 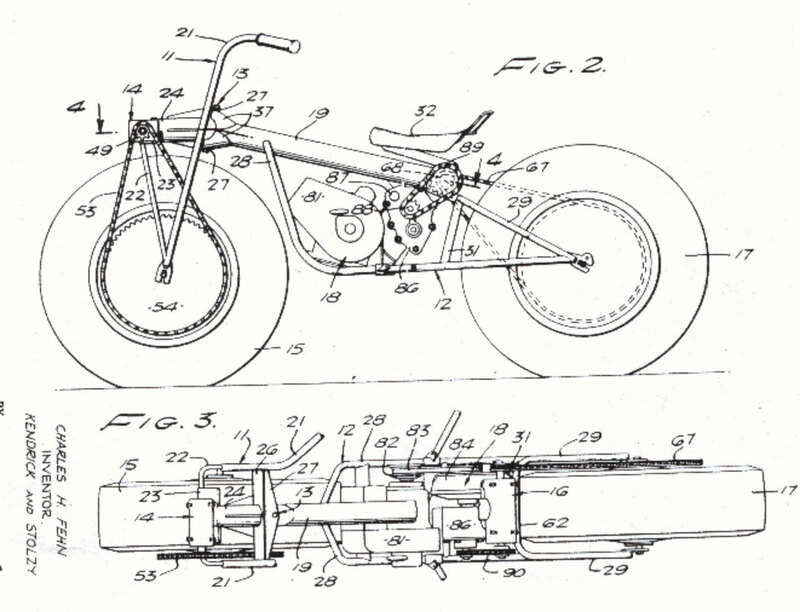 However, it was the two wheel drive motorcycle that captured his imagination. Friends of Charlie say he became fixated on the project and was relentless about its production until he was finally able to offer a kit model of the original design in the early 60’s. One of his investors, Orla Larsen, took the kit and began distributing it under the name, Rokon. Orla was also captivated by the two-wheeled bike and eventually took over production in Vermont. In an effort to improve some of the Rokon kit pieces, Orla hired teenagers as a testing team. He payed them $2 an hour to ride up and down a snowy hill, trying to destroy the motorcycles. While it was Charlie who had the original dream, Orla was the key ingredient to refining the bike and bringing it to market. After Orla took over, the bikes continued to improve and be offered in more models, colors, and upgrades. My first look at one of these Rokons was an ad in a vintage magazine. 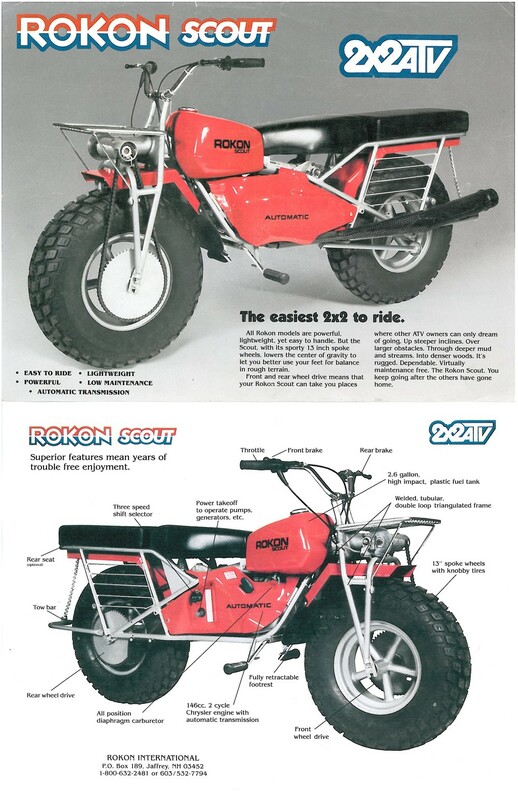 The add read “The easiest 2x2 to ride.” During that same time I was storing one of the later model Rokon 1 wheel drive motocross bikes for a friend. It’s funny how things group in pairs because it was the next day when Kamp Grizzly called me up and asked if I wanted to help build a custom 2X2 Rokon for an upcoming Danner project. My task was to make the bike look a little more slick and add a bit of the Northwest spirit. My first choice was to install a Stihl chainsaw holder. The stock seat, made out of plywood and vinyl needed replacing, so Ginger over at NewChurch Moto whipped me up a nice flat seat made with the toughest, high-grade leather we could find at the Danner factory in Portland. The original Rokon tanks are plastic and mighty ugly, so we replaced it with an old aluminum Triumph tank. We selected the colors to reflect the Northwest: safety orange, forest green, dark brown, with hints of chrome. The stock tires are old 3 wheeler style tires so I dug around and found these gnarly MUDBUG tires. They looked way tougher in my opinion. I wanted to hook something up to the auxiliary drive shaft but ran out of time. I guess there is always room for improvement. If you’re looking for speed? You aren’t going to find it here. If you’re looking for grunty power? Look past this vintage 2 smoker. If you’re looking for fun, well you found it. Surprisingly comfortable for my 6'1" stature, the Rokon looks small from far away, but feels like a normal size bike. To really test its ability to climb, we mounted 6 full size humans on the bike and had a nice little ride around the parking lot. I’m pretty sure it would take at least double that amount to really slow it down. We also pinned it, tug-o-war style, against the tried and true Honda XR250. Things didn't work out so well for the XR (with a confident rider might I add). A slow roll on the throttle was all it took to pull the XR at full mast backwards into the pit of despair. The best part about riding the Rokon is its ability to steamroll over things with ease. The whole point of the design was lightweight power achieved with massive gearing and traction. The balloon tires make it buoyant and grippy on any surface this little planet has to offer. However, it rides a little strange on flat hard surfaces like concrete or blacktop (but who really wants to ride on those things anyways?). Is this bike for everyone? No. Is it fun as heck to ride? Yeah! American made muscle and built for the great outdoors. Thanks Danner for the fun times and the protective boots. THOR DRAKE is the owner of See See Motor Coffee Co. a shop serving some of Portland's best coffee and selling a great collection of motorcycle gear.